Q: Is it necessary to have the same resolution for photos that one is attempting to combine. 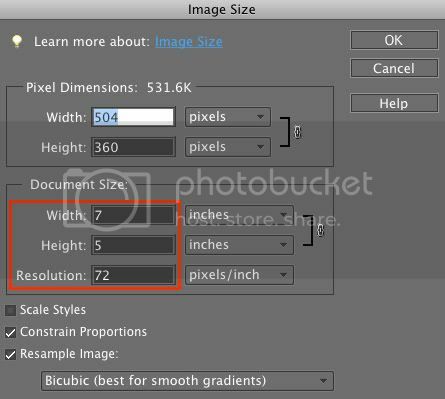 If, for example, I select one area of a photo and then wish to combine it with another of a different resolution do the resolutions of both the photos have to be the same in order to maintain total picture quality when editing is complete? A: If you bring a photo of one resolution into a photo of another resolution, the one you bring in will take on the resolution of the one you bring it into. You could end up with some unexpected results. You can see the dimensions and resolution of any photo you have open in Elements by going up to the Image Menu and choosing Resize>Image Size…. That will bring up the following dialog box. I outlined the dimensions and resolution fields in red. Let's say you have two 5" x 7" photos. One has a resolution of 72 pixels per inch (ppi) and the other has a resolution of 300ppi. If you bring the 72ppi photo into the 300ppi photo it will look much smaller even though it originally was 5 x 7. And if you drag the 300ppi into the 72ppi it will be huge and much of it will be cropped away. Of course you can use the File>Place… command to also size it as you bring it in. But the bottom line is it could be hit or miss. I believe the safest way to combine two photos is to match the resolution and change the size to what you want before you combine them. Just remember your quality could suffer if you enlarge either the dimensions or the resolution too much. You're generally going to be safer by sizing your photos down to a smaller size. Another consideration is what you plan to do with the photo. If it's just for viewing online then 72ppi resolution is fine. If you're going to have prints made you should have at least 240ppi resolution. And if it's going to be commercially printed in a brochure or something you should probably have a resolution of 300ppi. I hope that helps Sherry.